Looks great! Can’t wait to give it a try. Hey I love your website/podcast! I make a similar recipe but instead of draining the corn and beans and then adding water later, I just dump the entire can in. There may need to be some adjustments, but it might make this recipe even simpler. Georgia with one young woman having great success making her very first dinner party with my Sante Fe Chili recipe as the main course! Congratulations Megan and I hope your cooking skills continue to develop! Until last year, I was too afraid to step into the kitchen to even try to cook anything. Let’s just say I’ve survived all these years on Top Raman and eating out. I had more time on my hand the past few months and your website has been a blessing! I’ve made several of your dishes and the biggest surprise was how easy and fun it all turned out to be! When I first started out, I didn’t even know what green onions were let alone know how to find some of your ingredients at the grocery store LOL…let’s just say your website did for me what my mom’s been on my case to do for years = COOK! Congratulations Arti – That is fantastic! My niece actually began learning how to cook with this very recipe. She now adds her own special additions and her family loves her Santa Fe Chili! Good Luck developing your skills! My kind of recipe- 15 min prep time and let it cook!! Many thanks for a winning recipe. Maybe I missed something here. Are you supposed to drain the cans of tomatoes or just put the whole cans in? Thanks! Santa Fe chili is a classic recipe. 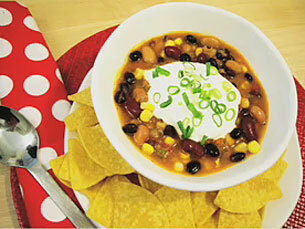 Learn how to make your own Santa Fe chili with this simple step-by-step video.